Milwaukee — It’s long held the reputation as Beer Town, and today, even though the city shines with a Calatrava art museum, funky converted warehouse districts, trendy restaurants and chic boutiques, beer still is an iconic part of the city for travelers. 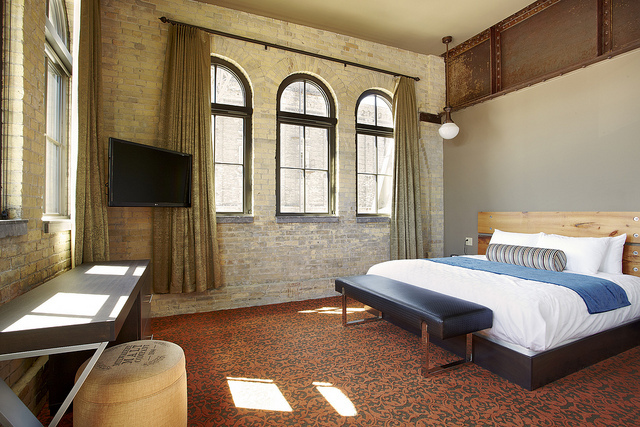 Just as the beer culture has changed from Milwaukee’s Best to craft brews like Lakeshore and Sprecher, the hotel scene has morphed from Holiday Inn to independent, boutique properties like the Brewhouse Inn & Suites. And yes, this year and a half old hotel is in the old Pabst Brewery. How’s that for getting your beer in a luxury and trendy way? Pabst was an integral part of the Milwaukee landscape, brewing downtown from 1882 to 1996. In the conversion to the 90-suite green property, much of the original structure and architectural elements were kept intact, leading to an upscale hotel that blends gritty and chic into a seamless experience. The building is listed on the National Register of Historic Places. 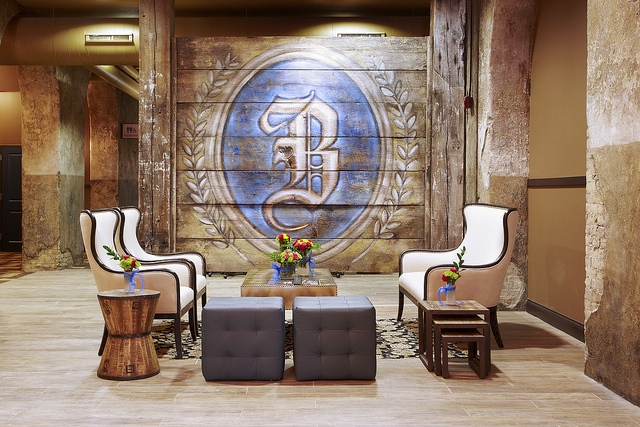 The hotel is part of “The Brewery,” a 20-acre LEED Platinum certified neighborhood, one of only five in the world. While it welcomes travelers for any duration, it’s designed for guests staying five days or more, as each suite has a full kitchen. Walking in to check in, I’m greeted at a front desk made from more than 1500 beer bottles. 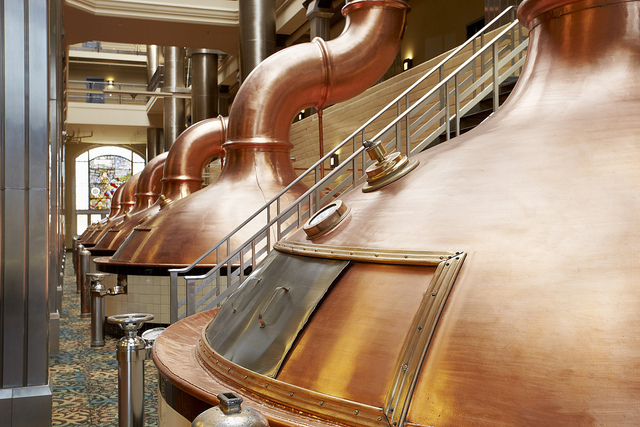 On the second floor are several copper tanks that used to be part of the brewing process. Rooms have touches of whimsy, like a Pabst Blue Ribbon beer bucket and a stool by the dressing table covered in fabric with a “Milwaukee Malt” logo. You won’t need beer goggles to appreciate the homage to beer and brewing here. There is no dearth of bars near the hotel, but if you’re in town on a Sunday, take the Riverwalk three-hour boat tour, which cruises down the Milwaukee River, and includes a brewery tour and stops at three microbreweries. Speaking of brewery tours, the most fun tour I’ve done anywhere in the world was Lakeshore Brewery. The combination of humor, information and of course, beer is not to be missed. Tours are also available at Sprecher and Miller. With all the drinking, you’re going to need to get some food in you. In the last few years, the restaurant scene has exploded with hipster and gourmet options, primarily in Bay View, The Third Ward and Fifth Ward areas, which are all neighborhoods near downtown. Open for just two months, Goodkind is located in a converted house in Bay View and is very much a local hang-out. Millennial owner Katie Rose tells me she and her co-owners did much of the renovation work themselves and when neighbors saw the construction, they actually pitched in and helped create the space. There’s that Midwest friendliness in action. This homey establishment emphasizes craft cocktails and locally sourced ingredients. In fact, the menu changes nightly and can feature anything from house speciality rotisserie items to vegetarian options like tempeh or vegetable tanginess. If sushi floats your boat, and it sure floats mine, head to Screaming Tuna on the bank of the Milwaukee river in the Fifth Ward or Kanpai Izakaya in the Third Ward. Cafe Benelux’s rooftop patio is a perfect spot to enjoy city views and dine on Belgium and American staples for lunch or dinner. It also has a 40 page beer menu, albeit focused on Belgium, not Wisconsin brews. Milwaukee is a town filled with bars, from dive bars, to craft beer watering holes to wine bars. Next to Screaming Tuna is the new Wine Maniac, or head to Black Sheep to try different wines on tap. For beer, the Uber Tap Room at Wisconsin Cheese Mart pairs 36 dairy state brews with over 175 local cheeses. The Palm Tavern, Sugar Maple and Roman’s Pub were all named in Draft Magazine’s 100 best beer bars for 2013. 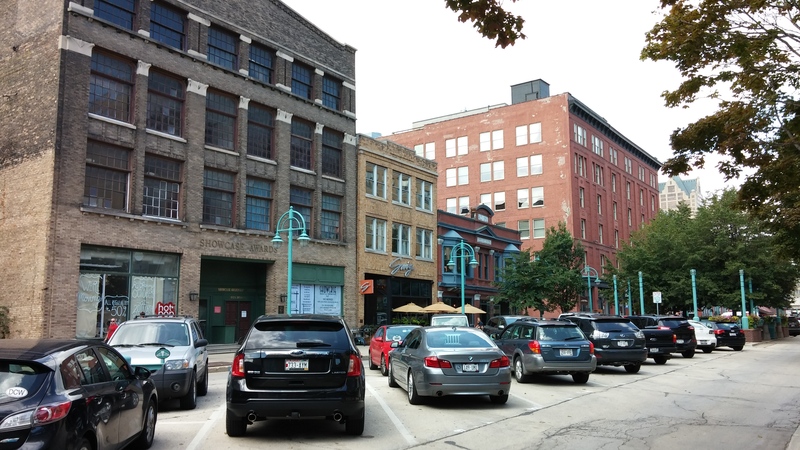 While Milwaukee has clearly evolved past the days of PBR, the city has stayed true to its brewing roots, offering visitors a chance to learn the history, taste amazing craft beers and spend the night where it all began. Dena Roché has covered luxury travel and spas since 2007. She has been published in magazines like Robb Report, Great Golf, Destination Weddings & Honeymoon, Bridal Guide, Day Spa and Spa. Her online credentials include contributing to Peter Greenberg Worldwide, Destination W and editing her own site, Fitglobetrotter, which focuses on luxury wellness travel. A former college tennis player, Dena has a passion for wellness and believes in playing hard during the day, but coming back to a luxurious hotel at night. In addition to her work as a journalist, she is a certified wellness coach focused on teaching people how what they eat and how they live shapes how they look and age.